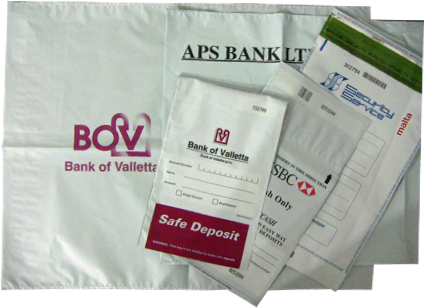 All types of bags for cash, coins, valuables and documents and can include a customised print together with a unique sequential number ensuring traceability and enabling the accurate pinpointing of breaches in security. Unique numbers can be printed as high resolution barcodes bringing opportunities for significant improvements in handling efficiency. The complete range is manufactured under conditions governed by ISO9001:2008, your guarantee of high standards of product quality. The security-bags supplied to our esteemed clients fully conform to standards set by the Central Bank of Malta which makes part of the ESCB (European System of Central Banks). We offer a wide range of security seals to meet all possible sealing needs including; custom seals, container and truck seals, indicative seals and seals with varying levels of security, types of locking, rings, adjustable straps, multiplicity of models, versions, materials and uses. In polypropylene, nylon or steel, all being customisable and numbered for the security and traceability of valuables and goods in general. Copyright © 2014 - 2019, Galaxy Ltd. A website developed by CyberMax Creations.